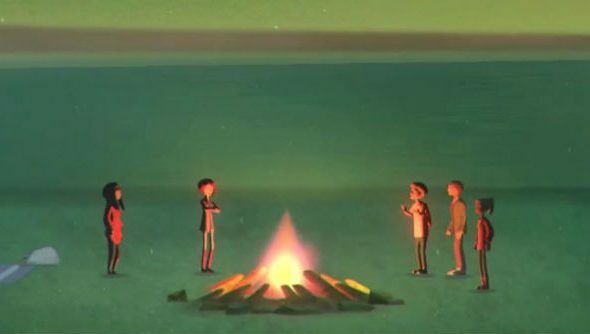 Oxenfree is a stylish 2.5D narrative-led adventure game from ex-Telltale and Disney developers about a group of teenagers who happen upon the supernatural while partying on a deserted island. If you haven’t heard of it before, it’s out this week and looks gorgeous. If you have, you might be interested to know a film and web docuseries are en route too. Oxenfree looks great, eh? So too do the games that made our best PC games list. The extra goodies come courtesy of a collaboration between developers Night School and Robert Kirkman’s – he of The Walking Dead fame – Skybound Entertainment that was announced today. Friday marks Oxenfree’s release, you see, thus Skybound will host an all-day livestream that kicks off at 11am PST. The Story of Oxenfree – a making of-type web series – starts today on Skybound’s YouTube channel, the first of which features below. There’s also plans to expand the game into a film. Although the premise may sound a touch on the cheesy, teen horror flick side, Oxenfree will have no dedicated cutscenes and operates a nifty Telltale-inspired chat interface. What’s more, engaging in conversation at all, apparently, is optional, thus it sounds unlike most games that fit this genre. Of the collaboration, Kirkman himself said: “As soon as we got our hands on Oxenfree and experienced this unique narrative driven game we knew that the IP had huge potential and that the Skybound team needed to be a part of it. Oxenfree is out this Friday, January 15.